Of course, I meant to say "driving me crazy", not "crazy me crazy", though "crazy me crazy" I am over this machine. Once again, my apologies for the typing. I had to keep using the original ribbon because of its peculiar width. And the right ribbon spool nut kept self-tightening. POSTSCRIPT: The Blick Universal continues to cause much confusion. I can't provide a definitive answer, as there is nothing on my Universal which indicates where it was made. Since it was marketed in immediate post-World War I Britain, that may be understandable. There does seems to be a majority opinion that the Universal was made by Adler. 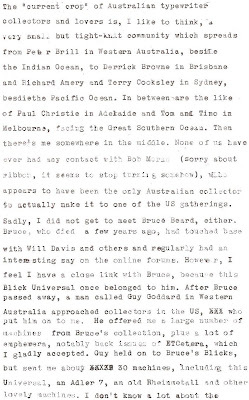 I largely go by what I have read, especially from Will Davis, who had an entry on the Universal in ETCetera in December 2001. 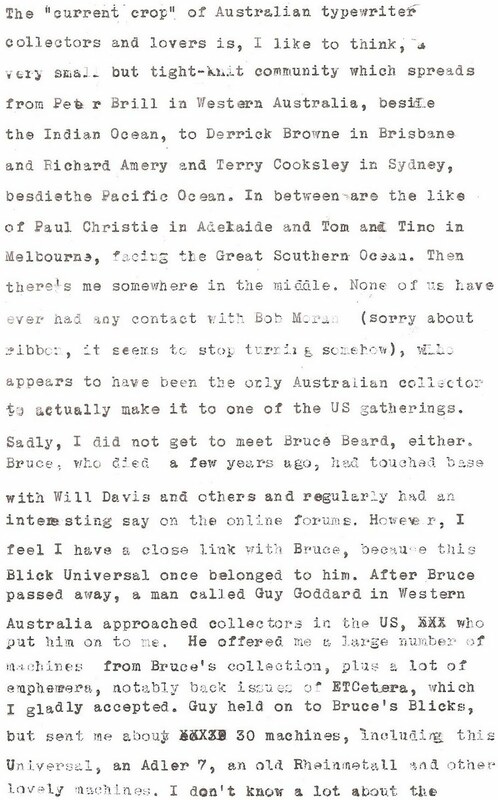 Before Rob Bowker commented on this post, I had meant to add to it that if you do a Google search for the Blick Universal, you will find conversations on an online forum (from 2005 in particular) about its origins, which involved, among many others, Rob, and Bruce Beard himself. Even leading authorities such as Paul Robert and the late Les Owen had asked questions about it. Will Davis seemed to provide most of the answers. On Will's and the late Tilman Elster's European Typewriter Project pages, Tilman's Adler collection includes no typewriter which approximates to the smaller, flatter, lighter Universal. For the time being, at least, I continue to conclude that the Universal is a one-off, distinct to the Cheapside, London, branch of Blick, albeit most likely made in Germany. There is no doubt that at its roots it is a Wellington. POST-POSTSCRIPT: I have since re-read Will's very well-researched, well-written piece in the December 2001 ETCetera. Very interesting. He is in no doubt the Universal is an Adler clone, most likely made in Germany. Nonetheless, I cannot find anywhere - on the net, in Beeching or any other publication - an exact Adler model match for the Universal. 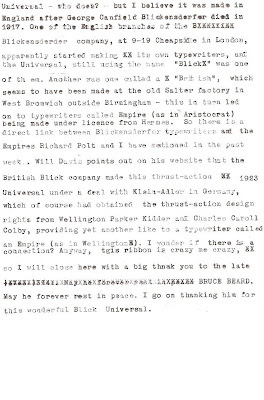 Could it be, then, that Adler used a on-off design just for the British Blick Co? There are, by the way, references to other German-made Universals, but not thrust-action machines, and not made by Adler. Hi Robert, now I'm confused. I dug around as much as I could several years ago. Piecing together what I could about the Blick brand and any relationship with Blickensderfer. I deduced, at the time, that my Blick Universal was made in the Adlerwerke, Germany. From comparison photos of Kleine Adlers, I couldn't tell them apart. The Blick whispers "I'm German" to me. Is there any way of knowing for sure? It is undoubtedly from the same gene pool as Wellington Empire. Rob, I'll dig out my Adler 7 (which I also got from Bruce Beard) and my Empire and photograph them together with the Universal for comparison. But it may take me a day or two, as they are in storage. 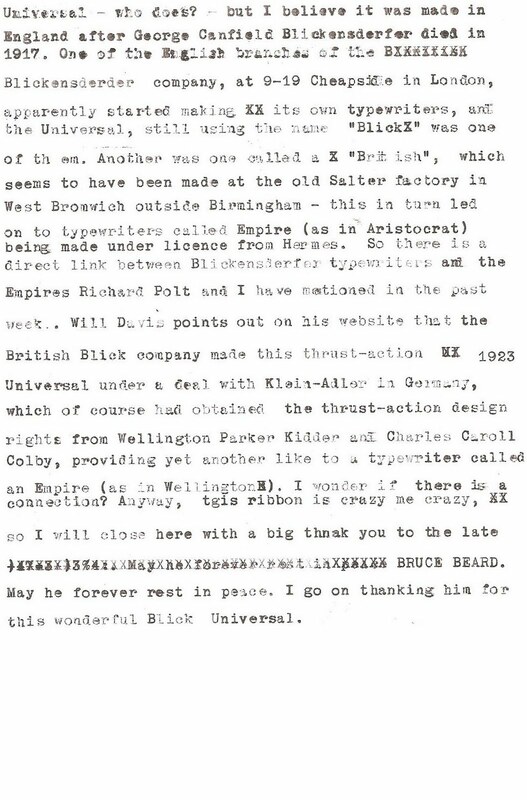 There is nothing on my Universal which indicates it may have been made in Germany, but given the London-based Blick Co had the British made in Birmingham, it is possible it had the Universal made in Germany. In the meantime, I have checked in Beeching. The Adler 8 of 1902 does seem slightly smaller than the 1900 7, but still higher than the Universal. By 1913 Adler was making the Model 21 (Favorit), which is a four-bank, virtually a portable. It is still thrust-action, but a different machine altogether from the Wellington-Empire-Adler line.